I think they have all the possibilities of rain covered. June 10th and we have the pellet stove on(my wife's friend is cold). To be fair it is 63 degrees inside. Low of 40 last night. Snow on the mountain peaks above 7000 feet. 01:30 in the afternoon and we just hit 51 F.
The frequent thunderstorm activity over the past week has been very disruptive. The day starts off with only a few clouds and not much later the clouds form with mostly cloudy conditions with numerous thunderstorms after 12PM . If you must mow your lawn, you must start early and seek shelter when thunderstorms approach. Lightning is extremely dangerous and most people killed by lightning are not struck directly but killed by the ground current. Be at least 75 feet away from where lighting strikes the ground. Lightning is extremely dangerous and most people killed by lightning are not struck directly but killed by the ground current. Be at least 75 feet away from where lighting strikes the ground. Good info didn't realize that. LMAO! As soon as I started reading that I was like "is he aware this is a WEATHER forum"? lol pretty sure everyone on here knows that, if not this probably isn't the hobby for ya. But how will I KNOW I'm being at least 75 feet away?? ^^ Your eyebrows won't be singed? Simple, you'll obviously know the future then rule the Universe. I'm pretty sure you are wrong. Most may realize electrifying the ground does occur, the immediate area around lightning but how far away is safe (75 feet) most have never read or heard about. I've read several lightning safety write ups and can't recall any number associated with what's considered a safe distance from lightning strike. It's great info if true because now campers, hikers, hunters, golfers and those caught in thunderstorms will know how far away to stand is safe, keep (75') from objects that may attract lightning. Your opinion on what hobbies people should or shouldn't take up, maybe that's something you should seriously look into. I'm a archer where distance is a big deal when you practice and we use the step off method, 1 yard steps. Can come pretty close within a yard out to 100 yards usually. We actually had a tree struck at camp one year, the 75' rule is good to know but still haven't found any corroboration. But you have no idea where or if it will strike. A direct strike within 1,000' could blind or deafen you permanently. I doubt many would be able to move comfortably for quite some time if a bolt hit within 100' due to possible nerve damage since we could be talking many thousands of volts. And there is no consideration for the ground makeup/soil content, whether wet or dry. Some types of soil may conduct better than others. Agree soil composition would have a lot to do with how far is safe. Moisture in and on top of ground I'm sure is factor also. Been a hot June here in this part of KS. Hot dry wind today. Wheat is turning fast. 86 feels like 84. Now this is beautiful. We are well below normal for June normally very wet month. We are hoping, but the percentages keeping dropping. Send some down here, Randy. Enjoy your Father's Day. 70s/90s with little precip chances forecast. degrees through Monday. Little relief is expected at night." Hot and humid here. Heat advisory. Rain later. Off and on all week. That means I will not have to water as much. Periods of showers and thunderstorms, mainly after 3pm. Some of the storms could produce heavy rain. High near 92. Heat index values as high as 100. South southwest wind around 10 mph. Chance of precipitation is 80%. New rainfall amounts between a quarter and half of an inch possible. Tonight: Periods of showers and thunderstorms, mainly before 1am. Some of the storms could produce heavy rain. Low around 66. West southwest wind 5 to 10 mph becoming north northwest after midnight. Chance of precipitation is 80%. New rainfall amounts between three quarters and one inch possible. Periods of showers and thunderstorms, mainly before 1am. Some of the storms could produce heavy rain. Low around 66. West southwest wind 5 to 10 mph becoming north northwest after midnight. Chance of precipitation is 80%. New rainfall amounts between three quarters and one inch possible. Might not break 80 today, or maybe just barely. Only got to 83 yesterday. 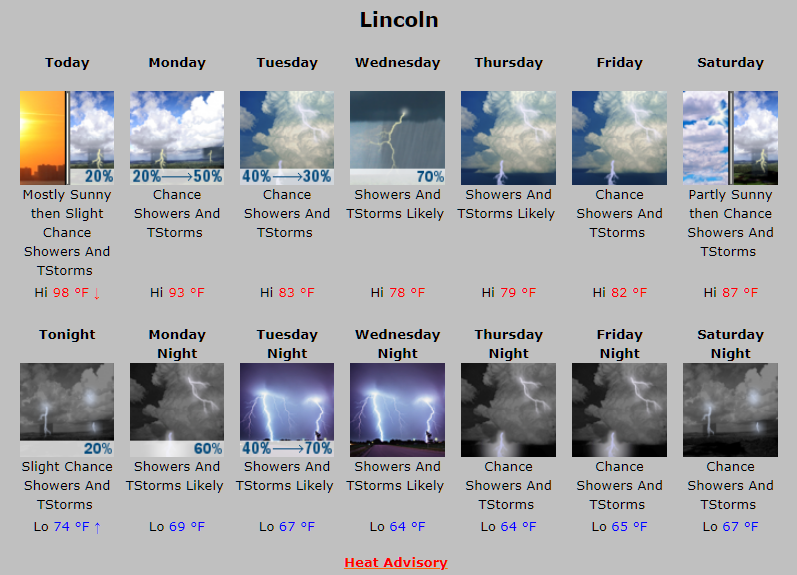 Big change from recent days, but the heat is coming back for sure next week. Similar here. A nice break from weeks of heat these past few days. Only 80 right now- a top 10 KS day. Heat returns midweek next. Blight is roaring through the tomatoes. Leaf-footed bugs are populating in biblical numbers. Weeds are growing rampant. Hot. Humid. Hazy. Yucky.